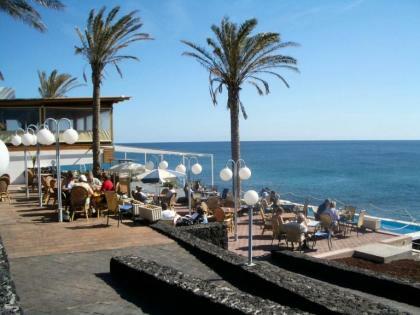 Lanzarote, Tuesday 21 February to Thursday 23 February. Tuesday 21 February. El Golfo Ride. Weather today was cloudy early clearing to a bright sunny day with a strong northerly wind. Temperatures reached 20C. I decided on a ride south to El Golfo village for lunch. I headed out via Yaiza and then the backroad loop across the lava field where it streamed down to the coast. El Golfo is a small village on the coast next to the half eroded volcanic crater. I found a restaurant with a sunny terrace for lunch. Then along the coast with views of the lava field stretching to distant mountains and the lava rocks being pounded by the Atlantic swell. Then under the main road and a climb on another backroad first to La Brenas and then Femes. 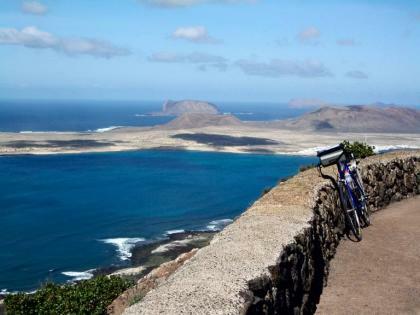 After an 18 to 20% grade on the last part of the climb I stopped for a drink at a restaurant with magnificent views down towards Playa Blanca and Fueventura. Then a long smooth descent and back to base. 34 miles for the day and 2200ft of climbing. Weather today started cloudy clearing during the morning. Wind was still a strong northerly. Temperatures reached 20C. 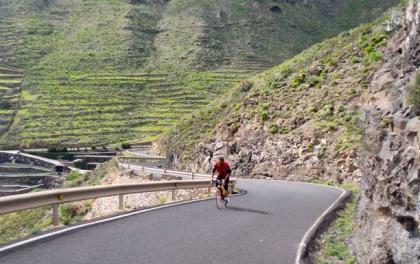 I took a short ride up to the central plateau taking lanes up to Tias and then Conil. Then another lane to La Vegueta and Tiagua. Then south with a welcome tailwind on the main road with a diversion onto a parallel lane on the old road via Tao. From San Bartolome a fast downhill to Playa Honda and the Prom/cyclepath back. 28 miles for the day and 1200ft of climbing. Weather today started cloudy but cleared by afternoon to bright blue skies. Wind was lighter but still a northerly. Temperatures reached 21C. I took a longer ride today with first lanes up via Tias to Masdache on the main road across the central Plateau at 1000ft. Then across to Teguise and a brief stop for a break in the Square. Then on the main route towards Haria but turning off at Los Valles on a backroad down to El Mojon and then the main coast road near Guatiza. 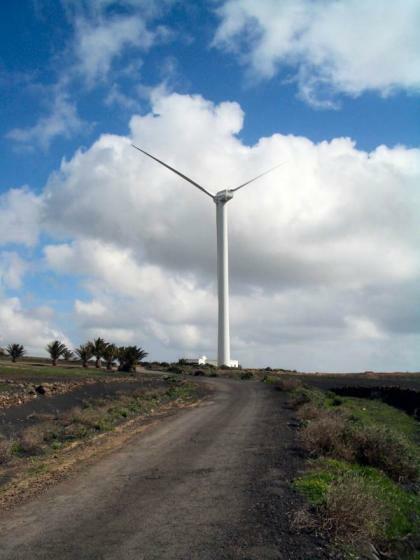 After a short way on the lightly trafficked main road I turned off for Costa Teguise. I took a side road down the NE side of Costa Teguise down to the Prom at Playa Charcos. I then walked or cycled all the way along the Prom. I stopped for a long leisurely lunch at a Restaurant adjoining the prom with a beautiful terrace next to the sea. Then on through Arrecife where I got an impact puncture after hitting a pothole. Only the second puncture in 6 weeks and the first on the road. The previous puncture was a slow one discovered at the Apartment. Then a gentle ride back along the Prom/Cyclepath via Playa Honda. 46 miles for the day and 2100ft of climbing. 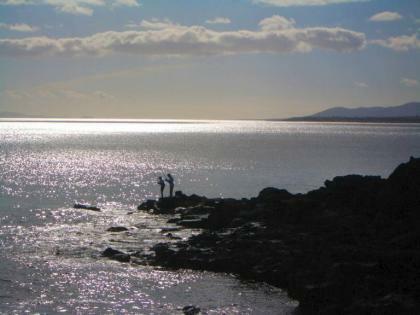 Lanzarote, Saturday 18th February and Sunday 19 February. Saturday 18th February. Beach Ride. 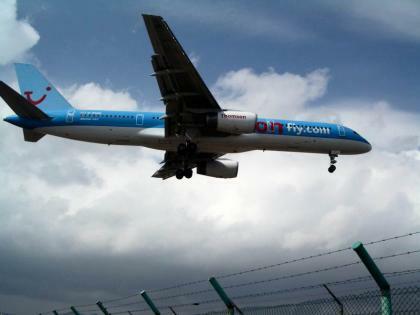 The weather was great today with light winds, sunny all day and temperatures getting to 21C. I decided on an easy flat ride with a stop at Costa Teguise beach. 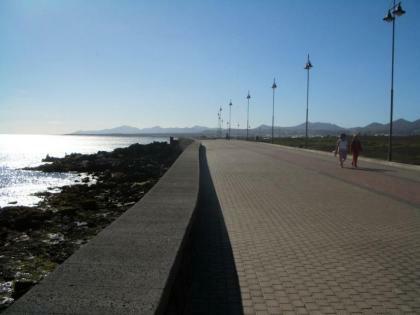 The ride was partly a route finding exercise as I knew the cyclepath from Puerto del Carmen to the south side of Arrecife but I had not tried going through Arrecife to get to Costa Teguise on the other side because of concerns about traffic. As it turned out being a Saturday traffic was quite light and I was able to find more routes on proms and lightly trafficked smaller roads nearest the coast. I found a back road into Costa Teguise going past the water desalination plant and linking up with the prom/cyclepath into town. 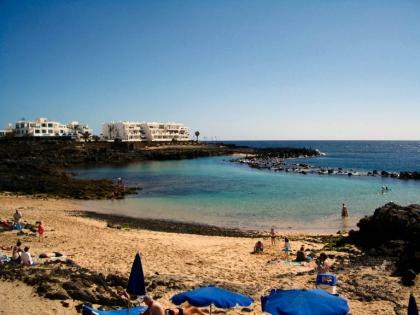 I spent the middle part of the day sunbathing on the main Costa Teguise beach which is a beautiful rocky cove. Then a late lunch at a restaurant on a terrace over the sea next to the cyclepath and a return on the same route. 31 miles for the day and 200ft of climbing. For the week ending today a total of 213 miles. Sunday 19 February. Guinate Ride. Weather was very good again today, sunny all day with scattered clouds and temperature getting to 20C. Wind was a little stronger than yesterday coming due north. I decided on a longer ride to the northern part of the Island. With light traffic in the centre of Arrecife on a Sunday I followed yesterday’s route along the coast to Costa Teguise. 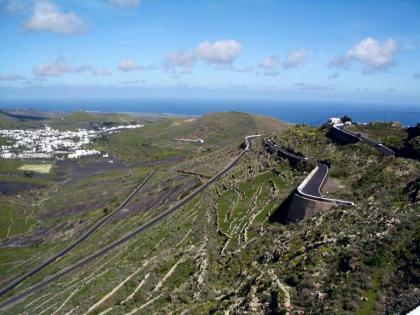 After an elevenses break for a snack on Costa Teguise seafront I headed inland to the main coast road climbing to 600ft. Then gradually down to sea level at Arrieta. Then inland on a long gradual 1000ft climb towards Haria. Just before Haria I turned off on a backroad to the village of Maguez and then up a little more to Mirador de Guinate. 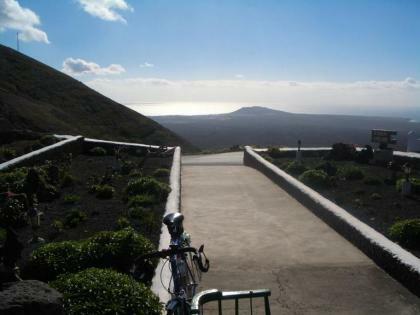 This is a viewpoint at the end of a dead end road with views across to the Island of Graciosa. Then back via Haria and up the hairpins of the big Haria Pass at 2000ft. I stopped for a late lunch at a restaurant at the top. Then a fast descent on a smooth road getting to 47 mph. I returned to base via Teguise, San Bartolome, and Tias. 62 miles for the day with 3100ft of climbing. Weather today was mainly cloudy in the morning clearing on the coast in the afternoon. Temperatures got to 19C. 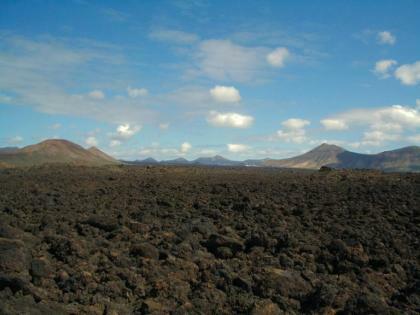 I headed south west to Uga and then across the lava fields to the volcanoes of Timanfaya. Then back roads north east into the wind to San Bartolome. I then threaded my way through side streets to pick up a minor road down to the village of Guime which is a few miles north of the Airport. Then down an 18% grade beside a quarry. I wanted to avoid the motorway style LZ2 road from Arrecife so I took a dirt road through the industrial estate down to a road running parallel with the main road to the underpass down to Playa Honda. 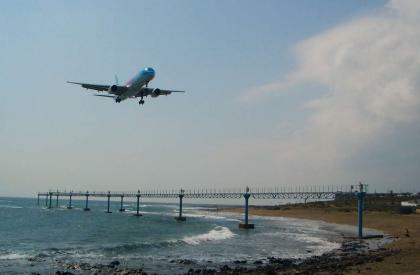 Then along the prom/cyclepath round the edge of the airport with a stop for some entertainment watching planes coming in to land with their wheels probably no more than 50ft above the prom. The second plane picture below is with the camera on standard lens setting – no zoom. 36 miles for the mornings ride with 1400ft of climbing. Weather today was clear early with cloud building up midmorning and clearing later. Temperatures got to 18C. I headed north today on a longer ride. First lanes via Tias and Masdache and then across to Teguise and a stop for a break and snack from my barbag in the Square. Then onwards and upwards on the Haria road. Near the top I took a little side road which led up to the wind Turbines well placed near the top of the 2000ft climb. Then down the hairpins and just before Haria I turned off on a quiet backroad winding its way down a valley towards the sea. Then back south on the new road with a welcome tail wind to Tastiche and then San Bartolome and down to Playa Honda and the prom/cyclepath back. 55 miles for the day with 3200ft of climbing.